Machas Artist Kaz Shirane: Sharjah Islamic Arts Festival 2019 from MACHAS on Vimeo. Japanese artist Kaz Shirane is not new to showing his work in Sharjah, commonly referred to as the UAE’s capital of Culture. 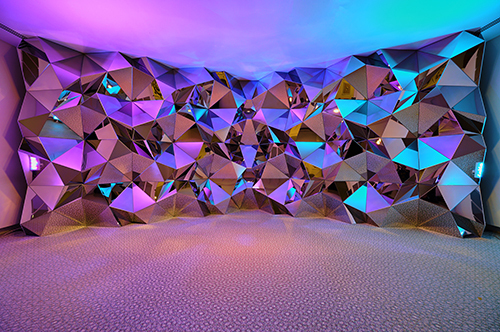 In 2016, he brought his work “Light Origami” at the Sharjah Islamic Arts Festival, leaving a lasting impression with an immersive, kaleidoscopic installation. Two years later, Kaz was invited to take part in the 21st edition of the one-month festival that gathers local and international artists to explore Islamic Art through their artistic vision. 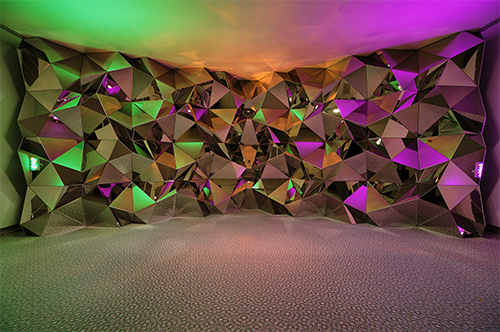 Kaz’s installation, entitled “Truth/Fake”, was a large-scale wall made of multi-faceted mirrors, placed on a bespoke floor design inspired by the fascinating geometry of the Islamic pattern. 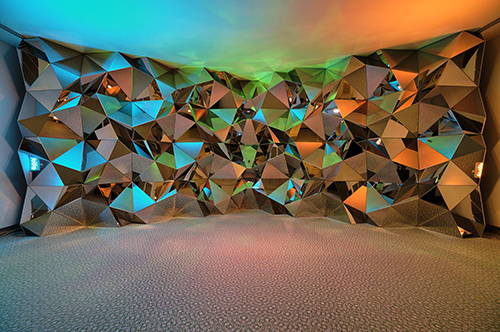 The impressive wall, reflecting changing colourful lights, invited visitors to look at their multiple reflections in its intricate mirror structure. For the new installation, Kaz Shirane was inspired by the old Japanese proverb of the blind men appraising an elephant, in which a king asks a group of blind men to explain what an elephant is by touching it. None could fully comprehend it, as each of them was touching a different part of an elephant’s body. “This teaches us the lesson that we cannot understand the truth from a partial understanding of something” explains Kaz,” as well as meaning that the same object will generate a different impression or evaluation in each person”. 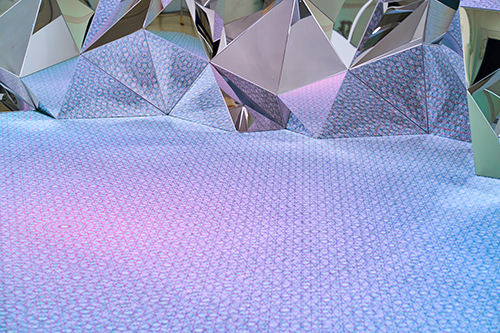 In addition to this main installation, Kaz unveiled “Mirror of Truth”: the new piece comprises of a series of mirrors that explore a new pattern on a flat surface, that dissolves and fragments the image reflected in a mix of distortion and familiarity. Exhibited for the first time in Sharjah, “Mirror of Truth” further invited visitors to reflect on the reality of their true self. 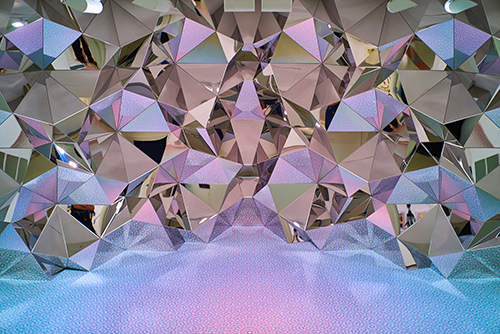 Kaz’s installations are multidimensional experiences that explore the relationship between the viewer and space, while using reflections to stimulate the mind. His contribution to the latest edition of the Sharjah Islamic Arts Festival was no exception to this rule and didn’t fail to impress visitors, many of them taking pictures and other digital memories of Kaz’s installations. During the inauguration of the festival, Kaz presented his work to Sheikh Abdullah bin Salem Al Qasimi, Deputy Ruler of Sharjah and his guests, followed by a few of interviews with the local and international press. See more of Kaz’s work here.